Batman Year One* is a faithful and extraordinary DC Animation adaptation of the seminal 1987 graphic novel by Frank Miller and David Mazzucchelli. "Year One" is the modern day canonical origin of Batman and heavily influenced Christopher Nolan's Batman Begins, primarily by shining a [batsignal] on the emotional and logistical trials and tribulations 25 year old Bruce Wayne (voiced by Benjamin McKenzie of Southland) faced in becoming the Dark Knight. Year One simultaneously gives equal heft to the character of James Gordon (voiced by Bryan Cranston of Breaking Bad), the only honest cop in the cesspool of Gotham City. In fact, Gordon rises as the more intriguing character; a transplant from Chicago (which coincidentally Nolan chose as the basis for his cinematic Gotham City) with a pregnant wife and a reputation as a snitch who turns in his fellow cops, Gordon bristles under the blatant corruption in the Gotham Police department. Yet Gordon is no saint. He and fellow detective Sarah Essen (voiced by Battlestar Galactica's Katee Sackhoff) begin an affair that compromises Gordon professionally and personally. Meanwhile, after a disastrous outing in crime-fighting that nearly gets him killed, Bruce Wayne divines almost supernatural inspiration to "become a bat" (the comic book's dialogue "Yes father, I shall become a bat" is omitted). As (the) Batman, Wayne targets the most powerful crime lord and city officials in Gotham, creating enemies on all sides. Only Gordon penetrates beyond Batman's vigilante acts and sees his behavior as heroic and necessary to rid Gotham of its corruption, thus the birth of their classic alliance. 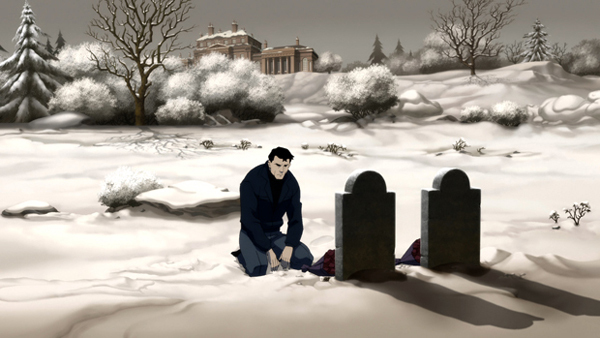 To its credit and occasional detriment, Batman Year One fiercely adheres to the events in the graphic novel, adding only minute enhancements such as an extended fight scene between Bruce Wayne and Selina Kyle (voiced by Dollhouse's Eliza Dushku). The animated film shares the weaknesses of the graphic novel, including its anti-climactic ending and the superfluousness of Catwoman to the story. Serious dramatic moments involving Gordon and Essen's affair inadvertently come off as trite and comedic, despite best intentions. The animation is superb, closely matching and even enhancing David Mazzucchelli's iconic artwork (panels from the graphic novel play over the closing credits). The voice acting by the well-chosen cast is also particularly strong all around, with none of the sleepy monotone often found in DC Animated films. Cranston in particular really sinks his teeth into the James Gordon role. Batman Year One is head and shoulders the finest DC Animation adaptation yet, whetting the appetite for the much-anticipated Batman: The Dark Knight Returns in 2012. * Batman Year One exclusively screened at the 2011 San Diego Comic Con.